I mean seriously, who doesn't want some fun custom business cards! 250 of them? yes please. You can use them for your business, as mommy cards or for calling cards! 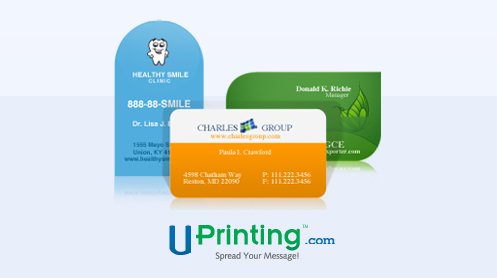 UPrinting.com has templates to help you choose your look, or you can customize by uploading your own images or text. They offer a great chic but cheap business card and of course the giveaway of the die-cut business card templates for customization. I really love the rounded edges, but you can choose the circular or leaf edge too- because you are just that cool. I'll announce the winner next Monday! Ooo, me, me!! Pick me!! Great giveaway, Shelli! I'm a follower of a' la mode! I follow a' la mode on twitter! I could use this for sure! I follow your gorgeous blog on GFC!